Regency Era London + Demons + Witty Heroine = MUST READ!! I was really looking forward to this book, as I am a HUGE fan of Historical Fantasy of any kind! This book had it all. All of the trappings of the Regency era that I love to read about. The clothing, the pressure to marry well, the elegant social gatherings that the London upper crust simply MUST attend because so and so will be there! I find it all so fascinating! Mix in a couple handsome young men, a young Lady who's curiosity could kill 100 cats, and Alison Goodman's beautiful writing; and we end up with one hell(literally) of a reading experience! The world-building was second to none. Goodman has a way of transporting us directly into the Regency era. I literally felt as if I too were attending every party, ball, and lunch. Not to mention the breathtaking action scenes that will have you on the edge of your seat! This is a large book for YA standards(which I LOVED), 496 pages to be exact, and I read it in a night and a few hours the next morning. It is exciting, fast-paced, and you simply MUST know what's going to happen next! By the end of the book, a good amount of the mysteries are revealed, but as this is a trilogy...which means more demons to battle, lives to save, and the Regency era in all it's exciting splendor! 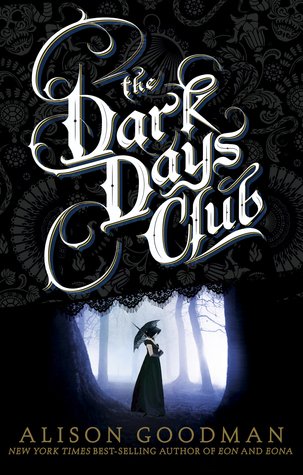 Enter to win a finished copy of The Dark Days Club by Alison Goodman courtesy of Penguin Teen! 5 winners will be chosen!